I have learned to accept the gentle smiles and assumptions of others when the subject of chickens is mentioned. It is always assumed that there is a quaint little yard and a chicken house with cozy nests and warm brown eggs. Actually, there is a setup just like that here, but it certainly isn’t the source of income that most people like to imagine from the movies and old stories. The chickens that make me money reside here for approximately seven weeks before they take up residence in someone else’s freezer. 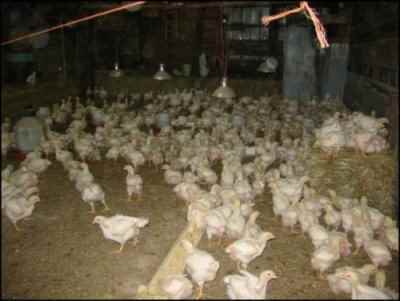 Approximately five years ago, I decided to again raise broiler chicks for sale to others. A neighbor had been doing this for a few years and was continually discussing having appointments to deliver orders of five to forty chickens to his customers. I had raised a few several years before and knew that, though the butchery at the end of the growing period can be work, beyond the first few days after delivery, chickens don’t require intense work. I asked questions regarding his sources for chicks, the cost per bird, where he was buying his feed. I “picked his brain”, so to speak. This little homestead has a nice big pole barn. It is approximately 50’ by 85’ and sits facing south on the property. It had formerly been used for feeding cattle, so there are no doors closing the 9’ by 14’ accesses on the south end of this barn. (Cattle don’t do well in enclosed places as they tend to develop pneumonia when too warm in the winter.) Over the years, we have used this barn for horses, primarily. One half of one side, the west, is the stallion’s residence. The eastern half has been used for pens for young horses or those under stress in winter. That eastern half has another valuable asset: its dirt floor. No, that dirt floor doesn’t lend itself well to sweeping, but with its ability to drain away moisture, it actually will stay dry much better than the concrete floors that were used throughout the rest of the barn. The barn sits unused, for the most part, in the warmer parts of the year, which seemed to me to be a bit of a waste. My theory has always been to make the most of what I actually have before I invest in additional equipment, facilities, etc. This barn wasn’t contributing to the fullest extent of its potential if it was sitting unused for most of the spring and summer. I decided to start some broiler chicks to utilize that barn and to, perhaps, put some change in my bank account. First, of course, I needed to get those broiler chicks! Both our local veterinarian clinic, which is only ten miles away, and the Running’s store, which is about forty-five miles away, carry chicks from Hoover’s Hatchery in Iowa. My neighbor had purchased from both places. The price per chick was lower at Running’s, but in one case he had found that not all the chicks were actually the Cornish crosses that have been specially bred to gain weight quickly and economically. In comparing the legs of the chicks, it was easy to tell very early in the program that some had far less sturdy legs than the others. Good broiler chicks must have legs that will support their rapid weight gain. A laying type of chicken will never gain the weight or the bulk that most of us expect from a meat chicken, no matter how much they are fed. I decided to order my first batch of two hundred chicks from my favorite vet clinic. In preparation for their arrival, I passed the word from neighbor to friend that I wanted to take any leaky water tanks off their hands. This caused a few raised eyebrows at first, but I have grown accustomed to that over the years. When they learned that these tanks would be used as a brooder for the new, fragile chicks, they were more than pleased to have me come and remove a tank that had developed leaks and, for them, was no longer usable. Young chicks require temperatures between 90 and 95 degrees for their first few days of life. They are also very intolerant of drafts. These stock tanks, with the higher sides for cattle and horses, are perfect for keeping the warmth of the heat lamps right inside where the chicks need it. I bedded the tanks with a light layer of ground corn cobs. These are another value-added farm product available at most farm stores, but I am fortunate to live near a family who has become wholesale suppliers. The ground corn cobs are not only very inexpensive (I pay $3 for a 50lb bag); they are also extremely absorbent (which keep the chicks dry and warm). Another asset is that, when the chicks have “graduated” from the brooder tanks, this soiled bedding is completely biodegradable and makes wonderfully rich mulch for the garden. The vet clinic finally called. The broiler chicks arrived! Oh, glorious day! I loaded the perforated cardboard boxes, each holding one hundred fragile little creatures, into the pickup right beside me on the seat. I also bought one hundred pounds of medicated chick starter. I know the trend is toward avoiding medication, but I really felt my investment was safer with a good strong start. With the enthusiastic aid of the dogs and cats, I unloaded each chick from the box, dipping its beak for its first drink of water, counting it, and placing it in that warm well-bedded tank. I had prepared enough waterers so that all the chicks would have free and ready access immediately. I was in business! I learned many valuable lessons that first summer in the chicken business. Some, however, were costly, as well as valuable. Technically, in our climate, one should be able to raise three or four batches of chickens like these before freeze-up in October. A little math shows that one can start chicks in mid-April, butcher them at seven weeks of age; start another about the first of June, another the first of August, perhaps even start new batches in stages before the others are done. In theory, that works. In actuality, working with the facilities at hand, I found out the hard costly way that it didn’t. South Dakota weather can vary greatly in those first weeks of April. One day may be warm and gentle; the next may hold drizzling rain, temperatures in the 30’s or 40’s, even sleet and snow. Keeping new chicks in a stable warm climate in those conditions is quite a challenge, and I found myself raising and lowering the heat lamps repeatedly as the chicks either clumped together (they can smother each other quickly if this happens) or fled the heat to the outside edges of the tank. I did have a horrible experience with one order of 260 chicks, in that I had made them very comfortable, heat-wise, but hadn’t covered the brooder with screen. The first day went well, but I found over half of them dead the next morning. I had a resident mink! I mistakenly blamed the cats, put on a new screen door, and realized my mistake when I found one sole survivor the next morning. I had been in business but two days and was already OUT of business! A grim lesson learned. The first days of June in South Dakota are usually wonderfully mild. The new chicks came in and were immediately quite comfortable and life was good…for a while. They flourished for about a month and then, suddenly, the various predators with offspring of their own came to visit and, it seemed, to teach their young the delights of killing and eating young chickens. I raised the sides of the pen with more chicken wire, but there is little that can keep a raccoon out if he/she has focused on a target. Day after day, I found wings, legs, and other various parts of my dead chickens lying all over the barn! Then the weather turned. The temperatures were no longer mild, but soared into the mid- to high nineties. Even with the large open doors, there was not enough air moving to keep the 6-week-old chickens comfortable. I tried to obtain fans that would perhaps keep them from dying from having over-heated, but it seemed that none were actually big enough. I only managed to save twenty-two out of over two hundred chicks. Another hard lesson learned. Having discovered some costly realities, I have decided to save money, stress, and heartache by simply bypassing those times of year that only seemed ideal for chicken production. Since then, the chicks are ordered to arrive at mid-July, when they actually benefit from the heat. It has led to selling the birds at a time of year when the focus has changed to my customers needing to fill their freezers for the winter. Another costly part of starting any enterprise is purchasing adequate and appropriate equipment to even start the chicks. Most of the equipment is, of course, reusable. Good heat lamps are a must, along with a supply of replacement bulbs. The lamp itself will cost about $8.00; the bulbs vary according to where they are purchased. The cheapest place I found for bulbs was Running’s, so they have kept my business. The little feeders for baby chicks are relatively inexpensive, but they are rapidly outgrown. The larger feeders are not inexpensive at all, costing about $15 for one feeder that is only three feet long. The main objective with these birds is to make eating as comfortable as possible, so it is a priority to provide them with adequate head-space. The best solution I have discovered is to simply buy the pieces of plastic eave trough that come in ten-foot-long pieces. Including the plastic ends that are available, a feeder of that size costs only about $9. The advantages of using these substitutes are that they are not only easy to fill, move, and clean; they are also easily stored when the season is finished. A constant and adequate supply of water is another necessity for healthy chickens that will want to keep on eating. I have used a variety of types of waterers, depending on the age of the chicks. The little one-gallon sized ones are perfect for starting the birds, but will by no means be sufficient as they continue to grow. Larger waterers are available in both plastic and metal. The metal ones are easily filled with a bucket, but seem to develop serious leaking issues even during the first season of use. The plastic ones are more expensive and are more easily filled with a hose than with a bucket, but their lifespan is much longer and, for some reason, the chickens themselves tend to prefer them. If at all possible, I do try to avoid carrying any more buckets than necessary, so I also have acquired an ample supply of hoses, each of which is at least 75 feet long. I have experimented with the automatic dog waterers that can be attached to a regular garden hose for a constant supply of water. It worked very well indeed, and I am considering devising a series of them for the coming season. They are available for about $16 each. Feed for a large number of birds can be very costly if one chooses to use the bagged varieties. One hundred birds may consume a five-gallon bucket full of feed twice a day. The bagged feeds are usually about $9 per 50-pound bag, so I checked with our local grain elevator about a ration for chickens at the various stages of their development. The manager was quite happy to research the available information for me. I found the price varied from starter feed to grower to finisher, but it was much less expensive overall. Storing bulk feed can be another issue, but I have an extremely elderly metal grain wagon whose tires are not only totally defunct, but are impossible to replace. It seems that tires for rims like those aren’t available anymore. That wagon doesn’t roll very well, but it easily stores two tons of chicken feed. The very fact that it is raised above the ground (and is metal) helps to deter the rodents that seem drawn to chicken-raising operations. Up to this time, I have patronized the butchering talents of a wonderful lady who lives in my area. She is now eighty years old and says she has “tapered off”. She used to clean one hundred twenty-five chickens per day in her heyday. Now she has “tapered off “to “only” seventy-five! She isn’t a large woman. She almost always has a smile. She is slightly hearing impaired, so her comments and laughter can be heard all across her yard as she works. She has been in this business full-time for almost forty years, putting two children through college on her “chicken money” after her husband died at a young age. She also built her lovely ranch-style home with money earned performing this menial job. There was a time that my friend and I offered to help her finish the last two dozen birds. Dear Flossie expected the worst from us! She had evidently experienced everything from revulsion to nausea from uninitiated chicken pluckers. She seemed rather impressed as we assisted her in every step, from removing the heads right on through to placing the chickens in plastic bags. I very early learned to weigh and tag each chicken immediately, as I sell them by the pound. This past season I started a batch of four hundred chicks, and then about two weeks later a batch of three hundred chicks. Even dear Flossie has her limits and having seven hundred chickens all ready to butcher NOW is asking way too much! I didn’t want them to all reach butcher weight at the same time as this type of bird doesn’t quit growing. I find that when the bird starts to “waddle”, it is most definitely time to head to Flossie’s house. If I wait much longer, it seems that they tend to make the ground shake when they walk! I have actually had a few birds that were accidentally overlooked. They dressed out to over eight pounds! My mother would call them “baby turkeys“, but they were still as tender as the smaller, more normal-sized ones. Throughout the growing period of the chickens, I contacted potential customers, informing them not only when the chickens would be ready, but also the price per pound and that I would be delivering the freshly-cleaned chickens to their doors at an appointed time. This past season, there were approximately seven hundred chickens to find homes for, so it was essential that a precise record be kept. I have a very valuable list of past customers, the quantity that they purchased, and their phone numbers. I also take note whether the customer prefers larger birds or the smaller fryers. If I had not taken orders for chickens in advance of their availability, I could have found myself with a shocking quantity of unsold birds on my hands. It seems like an unnecessary and costly service to actually deliver the birds myself, but what most people don’t take into account is that the fresh chickens need either to be kept chilled or be frozen as soon as possible. Delivering the birds immediately after collecting them from the butcher means that I myself don’t have to either provide freezer space for them or pay the electricity bill for freezing them. I only need to freeze the ones that I have left after my deliveries for that particular day. I will also take orders from people who live a distance away and would not be able to have me deliver their birds. For these people, I will freeze the birds until they are able to come for them. This coming season, I hope to raise and sell one thousand birds. There is no reason that everyone I know (and a few I don’t know) shouldn’t be having a wonderful chicken dinner at least twice a month! No, I won’t perhaps earn my first million dollars supplying chickens to my friends, neighbors, family and my family’s friends, but for a relatively short period of involvement, the money is good. I also have the pride of presenting my customers with food that I know has been raised clean, dressed properly, and will be not only tasty, but also a healthy addition to their diets. I am privileged to meet new people every year. My customers are always happy to hear from me and often will send others my way. The profits increase when there is no longer a need to buy equipment. All the money that isn’t spent in the barn makes a nice addition to my bank account. Each year, I find myself discovering ways to make it all easier and more efficient. Please note: we made sure that there were chickens for our own use!! *We used very little electricity for heat lamps as we had “started” the birds during the warmest part of the season. **One should expect a death loss rate of approximately 4%, but our daily tally showed we had slightly higher loss due to some unforeseen circumstances keeping me from having the birds butchered before freeze-up this year. ***The equipment purchased, hoses and waterers, is reusable for the coming season. One improvement we hope to make is to have a water hydrant installed inside the barn itself, eliminating the need for so much labor. Each year we learn ways to not only save money, but to make the whole process more efficient and labor-saving.